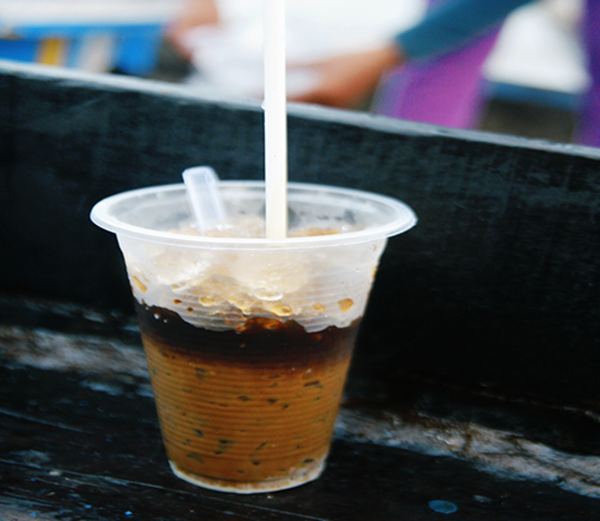 Especially, Cai Rang floating market has a reputation for various kinds of delicious breakfast. Imagine you are sitting on a small boat bobbing in the middle of the river, enjoying a steaming hot bow of Hu tieu or Bun rieu or sipping a cup of iced coffee. It would probably be such an unforgettable experience! 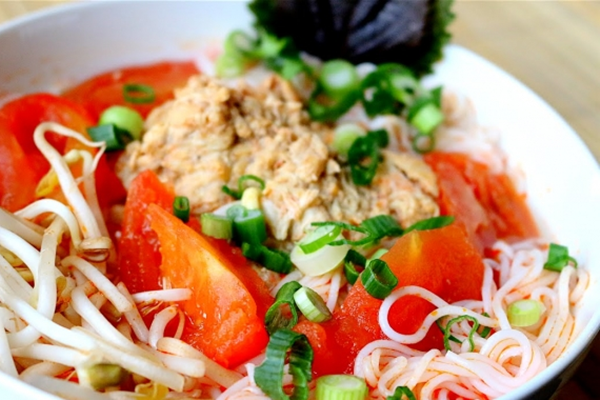 Bun rieu has listed by Skycanner website as one of the attractive people should taste at least one. It is very distinctive with special and strong taste of Mam tom (shrimp sauce), crab and a little hot taste of pepper. A bow of bun rieu is not only distinctive in its taste, but look very appealing with the red color of tomato, green of vegetables and white of noodle. Mixture of those ingredients creates an explosion in taste and aroma. This dish is rich in nutrition: calcium from the ground crab shells, iron from the congealed pig’s blood, and vitamins and fiber from the vegetables. Hu tieu is a typical dish in the south-west part of Vietnam. Gordon Ramsay- a renowned British chef has chosen Hu tieu, which is one of the most famous dishes in Cai Rang floating market, for the test in American master chef season four. 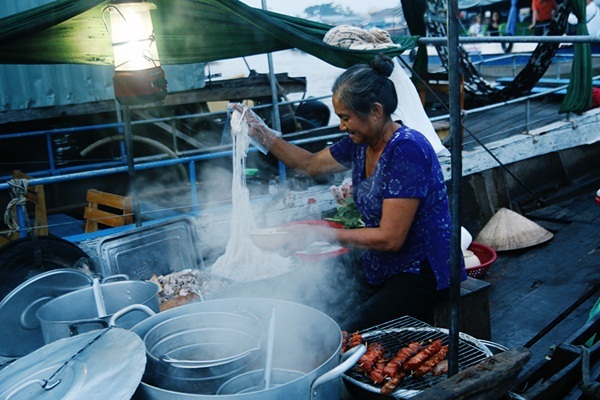 Hu tieu is common in almost every market in Mekong delta; however enjoying a hot bow of Hu tieu in a small boat floating among immense river at the early morning will give you a memorable experience. One of the most interesting things you would probably want to try when coming here is to enjoy a cup of iced coffee on a boat, breathing fresh air and chatting with a friendly local people. 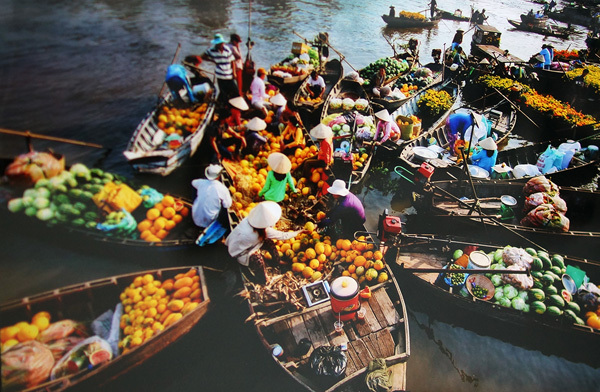 Here are list of the most attractive dishes you can enjoy when you pay a visit to Cai Rang floating market. 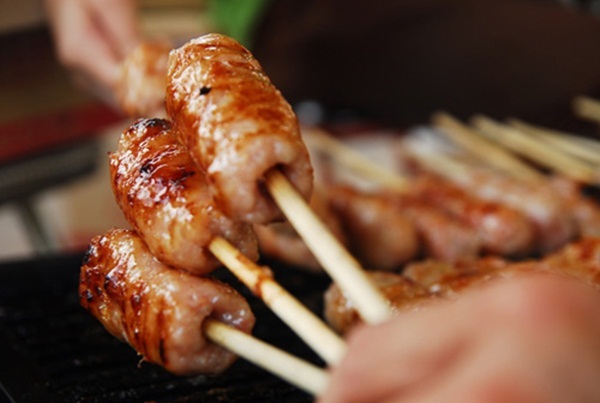 Delicious local food, warm and friendly welcome from local people, discovering life on boat would probably be what you are looking for your trip with friends and family after overload of work to escape from the hustle and bustle of the city life.